Tommy Byrne is considered to be one of the greatest racing talents never to live up to his potential. Coming from a very humble background in Ireland he made his way into motor racing through sheer determination and scraping together the funds to go racing by any means possible. When he was given the opportunity he was absolutely sensational, and rocked the British junior categories with championship victories in Formula Ford and Formula 3. His early career ran parallel with Ayrton Senna's and many claim he was one of the only drivers the Brazilian genuinely feared. Byrne graduated to F1 before Senna, but made one of the biggest mistakes of his career by driving for the underfunded and excruciatingly slow Theodore outfit in 1982. If proof is needed that Byrne was better than his early F1 results suggest, his test with McLaren the same year is it. Despite being told by Ron Dennis that he would not be offered a drive (part of the reason he took up the Theodore role), he had a test with the team due to a sponsor's obligation. Testing on the same day as Theirry Boutsen, he went faster in a McLaren at Silverstone than any other driver had been before. It later emerged that his times may have been quicker than the official figures suggested and what's more he was doing it all with less than full throttle. 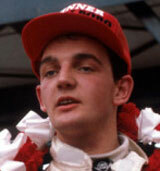 But the test was largely overlooked and Dennis remained firm on his decision not to employ him as a McLaren driver. The lack of interest led him to become disenchanted with F1, and despite racing for Eddie Jordan's F3 team in Europe the following year, he eventually gave up on his dream and went to race in the USA. He took a number of wins in American series but never achieved his potential in top-flight motorsport. He now works as a race driver coach in Ohio and is the award-winning author of his brutally honest autobiography Crashed and Byrned.